Generic information, not much that’s useful… just stuff like “use modern hotels that probably have access ramps” and the like. I was looking for specific information on using inter-urban buses, but any specific information for mobility limited visitors and residents is appreciated: richmx2 (at) live (dot) com. The Metro has separate platforms and cars reserved for women (and children under 12). While some passengers (or police) may not object to handicapped men using the generally less crowded Women’s cars, it is illegal, and women are likely to object. The METROBUS, on the other hand, was designed for wheelchair users, with ramps, special seating for the handicapped. Men and “persons of the third age” (i.e. “old”) people, regardless of gender, can use the front section of the bus, which is also for women and children. Torre Latinoamerica… access and what a view!! 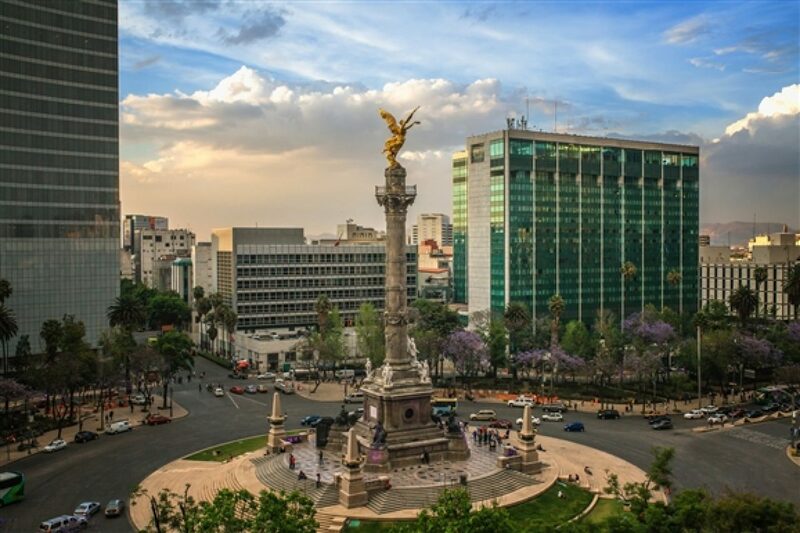 Many thanks to “The New Travel” for this wonderful video showcasing Torre Latinoamerica. Not only does it provide one of the most spectacular view of the city, it is also the most accessible place from which to get a breathtaking look at this amazing city. Others I know of… like from the top of Tepayac (the Basilica of the Virgin of Guadalupe) are impossible to reach from wheelchairs (it’s a long, long climb up uneven stairs) or not really open to the public. The Torre though, not only provides excellent access (there is a ramp into the building, and guides are available for the elevator), it sits at a corner that to my mind is one of the easiest places to see some of Mexico City’s most important landmarks without either wearing yourself out, or having to depend too much on the kindness of strangers. Yes, pedestrian traffic is absolutely insane at that intersection, but, the walkways are all flush with the street, the crossings are long enough to let those of us moving a bit slower than others to get through, and the transit police are accommodating to our needs… they’ll hold back the cars and get us across safely. The building is not only a city landmark, but an important piece of architectural and engineering history. When it was built in 1956, the very idea of a building more than 8 or 10 stories in an earthquake prone region was unthinkable. But, sitting on 361 pylons sunk 34 meters deep, and with an aluminum and glass facade over the steel frame, what was originally conceived as a “mere” 27 story office tower, could be redesigned as the 44 story tower that was built… and withstood the 1957, 1975, 1985 (the worst earthquake in Mexican history, and one of the deadliest of all time) and 2018 quakes with only superficial (and easily repaired) damage. Kitty-corner from the Palacio de Bellas Artes (where WE are lucky enough to get to use the art deco elevator, while the masses have to slog up the stairs to view the murals by Orozco, Rivera, and others that wrap around the upper story foyer) and a block from the over-the-top General Post Office (a cross between a cathedral in art-moderne style and something that might have been designed by Gustave Eiffel dropping acid) the block features even sidewalks, gentle slopes and wide curb cuts. Enjoy the view… and better, enjoy it in person! A useful site to consult before making a trip is the “Red de Museos para la Atención a Personas con Discapacidad” (Web of Museums catering to handicapped people)… while not infallible, it basically lists what services are available to those of us who are differently abled. The site is, of course, in Spanish, but easy enough to decipher. Most major sites (including the National Palace and the Antiguo Colegio de San Ildefonso (site of the famous Rivera and Orozco murals) do the best they can, but those painting run up staircases that make it difficult to explore in any depth. The guards and staff in museums here, will do their best to cater to interested visitors. Some museums allow wheelchair users free access. A few charge more admission for foreigners than for residents. Sundays are generally free to all.